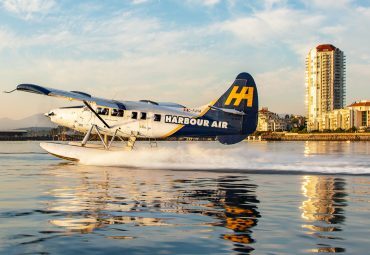 Harbour Air says it will convert more than three dozen seaplanes to electric motors. There’s no shortage of companies working to build electric aircraft, but a Canadian airline and a Seattle-area engine maker say they’ve found a quicker route to electrification by converting a small bush plane with batteries and an electric motor. The first passenger flights for British Columbia-based Harbour Air Ltd. would be in late 2021 under a partnership with MagniX Technologies, pending regulatory approvals, the companies said on Tuesday. They plan to swap kerosene fuel tanks for a MagniX electric motor and lithium-ion battery packs on a Harbour Air De Havilland DHC-2 Beaver aircraft, which seats six passengers, to begin test flights in November. The propulsion system will have a range of about 100 miles. The goal is an emissions-free, quieter aircraft that is certified by both U.S. and Canadian aviation authorities, Greg McDougall, Harbour Air’s founder and chief executive officer, said in a telephone interview. The suburban Vancouver-based seaplane company flies about 500,000 passengers each year from British Columbia and downtown Seattle. Worldwide, there are some 100 different electric-aircraft programs in development, according to an estimate by consulting firm Roland Berger GmbH. Zunum Aero Inc., backed by Boeing Co. and JetBlue Airways Corp., aims to bring a hybrid-electric commuter model to market by 2022, while Joby Aviation Inc., another JetBlue-backed electric firm, is working on a five-seat aircraft with a 150-mile range. Batteries remain the limiting factor for electrical propulsion in aviation, said Roei Ganzarski, MagniX’s CEO and a former Boeing executive. The Magni500 electric motor to be used in the Harbour Air flight testing is rated for 750 horsepower and offers a 60-minute range, more than twice as long as Harbour’s average flight, Ganzarski said, allowing for a 30-minute reserve on the batteries. The converted plane will weigh the same as the conventional Beaver model powered by a Pratt & Whitney PT6 engine, Ganzarski said. Over time, Harbour plans to convert its 15 Beavers and 22 DHC-3 Single Otter seaplanes to electric motors, McDougall said. The flight testing aims to win regulatory certifications for both the electric propulsion system and for commercial conversions of the De Havilland aircraft. McDougall said one primary goal of the testing will be to show that the electric motor is “at least as safe or safer” than the current engine.